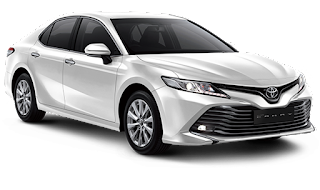 Toyota has just launched the All New Camry in January 2019. This is one of the masterpieces of their sedans that changed dramatically. This is Toyota's second car in Indonesia which uses the new Toyota New Global Architecture platform (TNGA) after previously there was the Toyota C-HR. As in CH-R, this new platform offers excellence in terms of driving impressions, a body that is lighter and more rigid, making it more fun to drive. And I found the All New Camry hybrid engine version, as the highest type, which has a tag of US $ 61,000. In appearance, the latest Camry has changed dramatically. 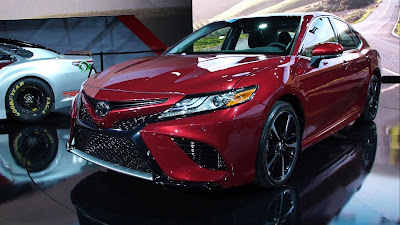 At first glance, the first time I saw it, the Camry seemed to offer two different design characters. The front is more aggressive, sporty and futuristic, while the rear retains the elegance and luxury of a typical Toyota luxury sedan. Starting from his face which is now much more aggressive. The bumper air flow is made bigger with a dynamic horizontal line pull and cool, you don't have to use chrome accents. While the lights are all full LED. Starting from the projector LED lights as the main lights, to the dusk lights, the beautiful and futuristic three-line DRL, also the LED fog lamp. The bonnet looks really big, behind it is a 2,500cc capacity engine that is capable of producing 180 hp and 230 NM of torque. And because it's a hybrid, the engine power is still added to an electric motor that has torque reaching 203 Nm. So you can imagine, what is the total torque on the All New Camry — around 400 Nm more! The hybrid is not yet a plug-in, so it can't be stuck in a home power socket. To check it, rely on a gasoline engine as a generator and kinetic force from wheel rotation when it is both creep and desaturation. 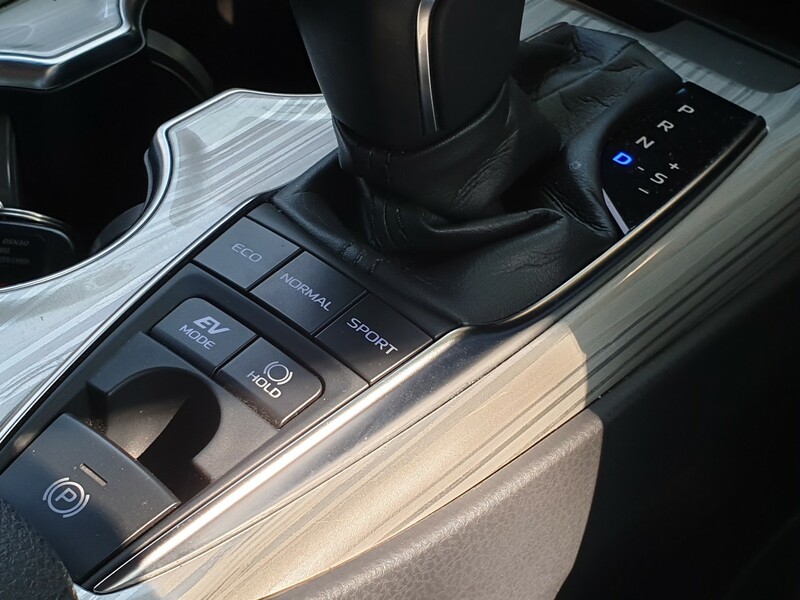 There are 4 driving modes, ECO, Normal, Sport and EV Mode. The latter, when the battery is not low, the Camry can run only by relying on electricity. All mechanisms for transferring power from the gasoline engine to electricity occur automatically according to needs and conditions. The result, besides the car being much more powerful, fuel consumption is far more economical. For 2,500cc engine cars, the average fuel consumption in cities translates into 14.8 per liter. How does it feel to drive the All New Camry? Hmmm, of course according to Toyota's promise, the TNGA platform made the Camry more fun. The handling is good, more than a sedan, and the suspension damping feels very expensive. And really, the acceleration is really trashy, because the gasoline engine's torque is added to the power support of the electric motor. As a result, we can feel the turbo engine sensation, but this one is more exciting because there are no turbo lag symptoms. The term, once the gas pedal is stepped on, we like being grabbed and pulled back. Fortunately, upholstery holds your back very comfortably, plus there is a seat cooling feature through an ac burst from behind the pores of the upholstery. The seat arrangement is full electric, also the steering wheel, tilt and telescopic settings can be arranged using an electric lever to the left of the steering wheel. The steering wheel is also complete, many buttons on the right and left, to activate audio, cruise control, to MID. In addition, there are paddle shifters behind the steering wheel. 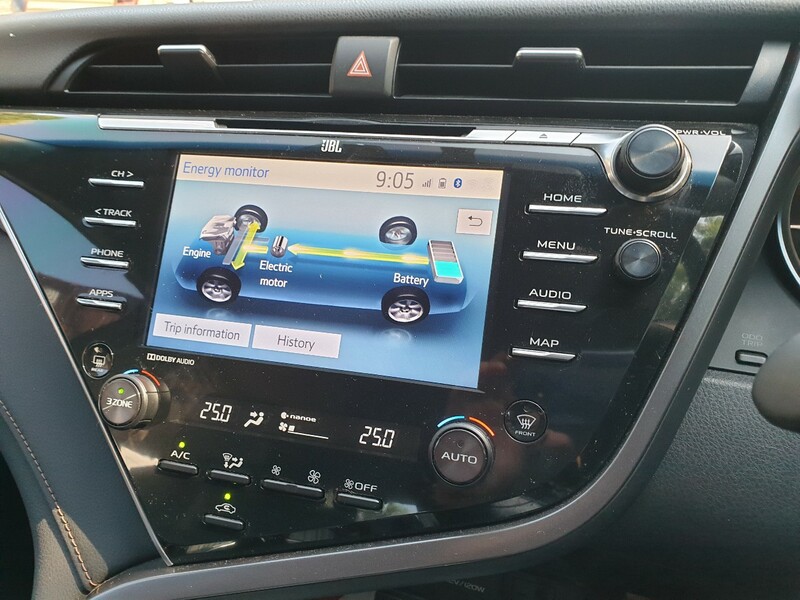 Well, the audio screen also feels luxurious and sophisticated and has been integrated with the car, because from the screen it is the arrangement of the car, until we can monitor the hybrid system. The sound quality itself is very good, especially for the details, even though the bass is less kicking. Audio Camry is worked on by JBL, and there are 8 speakers plus 1 sub woofer in the cabin. Now we're back, because this is the most enjoyable part of the Toyota Camry. It feels like sitting in the back, it must be comfortable. the seat backrest can be electrically reclined. There are also storage and storage sockets. Then, there are already a pair of windows curtains, and the rear glass is also available curtains, which can open the lid automatically. So if the car backs up, the curtain will automatically open. All the settings, plus audio and AC settings, can be done through controls that are on the armrest in the middle of the back seat when opened. 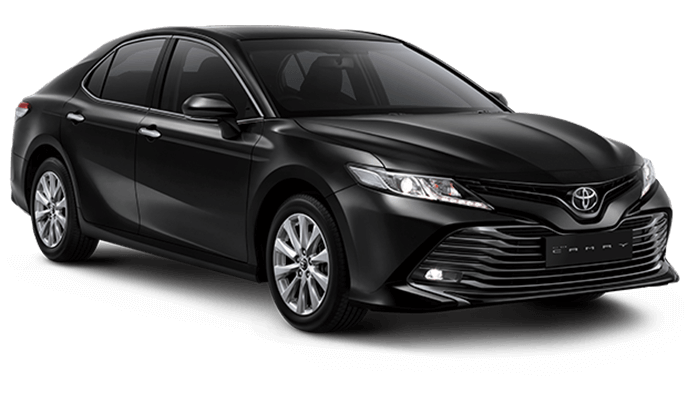 So, in addition to a display that can have two characters, sport and elegance, even in the cabin, this new Camry will offer two choices. So the boss doesn't have to be a passenger and sit in the back, once in a while they can also try driving themselves and feel the sensation of a sports car on the All New Camry. 0 Response to "Test Drive Review of the All New Camry, Toyota Sedan Revolution"